As its name suggests, stuffing is traditionally stuffed into the cavity of the turkey and roasted. Gallery: Who passed the dressing? Six generations of women have served the dressing that Mary Margaret Fussell Dykes will place on her family's Thanksgiving table. "It's a family recipe that has been handed down over generations. The farthest back I can track it is to my great-great-grandmother Mary Jane Kelly Jones Varner of Soddy-Daisy," says Dykes, a former Chattanoogan who now lives in Atlanta. It's a labor of love to prepare each year since the time-consuming recipe calls for homemade cornbread as an ingredient, but it wouldn't be Thanksgiving without it, she says. So she divides its preparation into two cooking sessions: First making the cornbread in September, which she freezes until she's ready to complete the dressing later. Many cooks use the terms “stuffing” and “dressing” interchangeably. 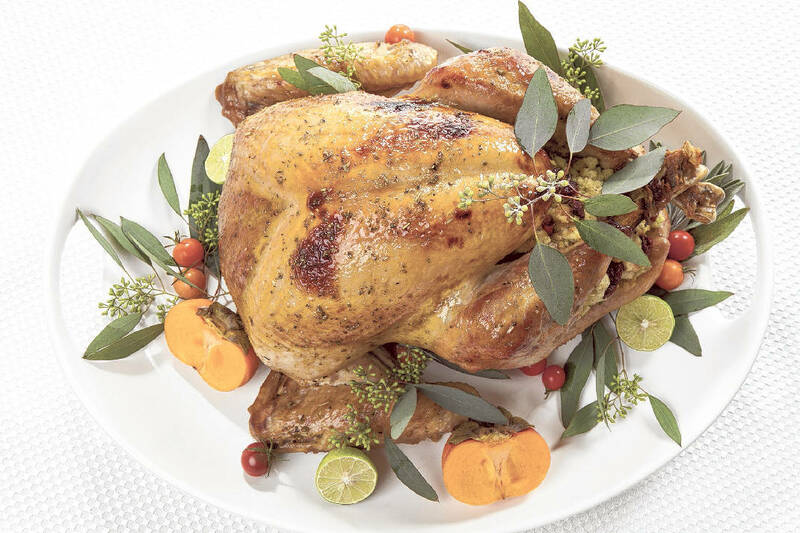 But if that savory mixture of bread, herbs and veggies is prepared outside the bird, the proper name is “dressing.” If it’s cooked inside the turkey cavity, that’s “stuffing.” A Butterball survey found that, south of the Mason-Dixon line, most cooks just call it “dressing,” regardless of its preparation. Whether you call it stuffing or dressing &mdash; and in the South those terms are often used interchangeably &mdash; it's the one side dish that is inseparably linked with turkey on Thanksgiving. "One day in October when I have a quiet day, I will make the dressing, wrap and freeze it raw. I can then take it out of the freezer the night before I want to serve it and let it defrost. I always make a triple batch and freeze one for Thanksgiving, one for Christmas and one to use sometime in the spring of the next year," she says. Whether you call it stuffing or dressing — and in the South those terms are often used interchangeably — it's the one side dish that is inseparably linked with turkey on Thanksgiving. And everyone has their favorite recipe. "I use old sourdough bread and cornbread. Pan dressing only," says James McKissic, director of the Office of Multicultural Affairs for the city of Chattanooga. "I have a recipe that makes really good stuffing in the crockpot. It's moist and easy," says Laura Burgess, customer care specialist at Girl Scouts of the Southern Appalachians. "But it's not as good as my late great-grandmother-in-law's recipe involving cooking and deboning a whole chicken, making homemade broth, homemade cornbread and homemade bread. That takes three full days." "I make dressing, and I like it crispy on the top and moist in the middle," says Laurie Shipley, a former retirement investment specialist. As its name suggests, stuffing is traditionally stuffed into the cavity of the turkey and roasted. Though this method allows the bread mixture to absorb the turkey juices for a moist result, the raw bird can pose a sanitation risk. Cooks must be vigilant to see that the stuffed turkey's breast meat reaches a minimum temperature of 165 degrees on a meat thermometer. It's easier to cook dressing since it's prepared separately from the turkey, but it can tend toward dryness since it doesn't have the bird's juices to absorb. To avoid dryness, cooks add broth for moistness. "In my mind, the magic of this dish is using real turkey broth instead of chicken broth. It makes all the difference," says Dykes of her family dressing recipe. "I reserve eight cups of rich turkey broth from the turkey I cook the previous year, strain and freeze, and it is perfect a year later. If you haven't reserved turkey broth, sometimes you can buy turkey bullion at specialty grocers." The beauty of making your own stuffing/dressing is being able to choose your favorite ingredients and binder, or bread. Options include dried fruits, fresh produce, sausage, nuts and grains. The binder that sticks it all together might be sourdough, rye, white, wheat or cornbread. If you opt for store-bought, packaged stuffing, keep in mind it is often high in sodium. Keep salt under control by monitoring added ingredients in your mixture such as sausage and broth. 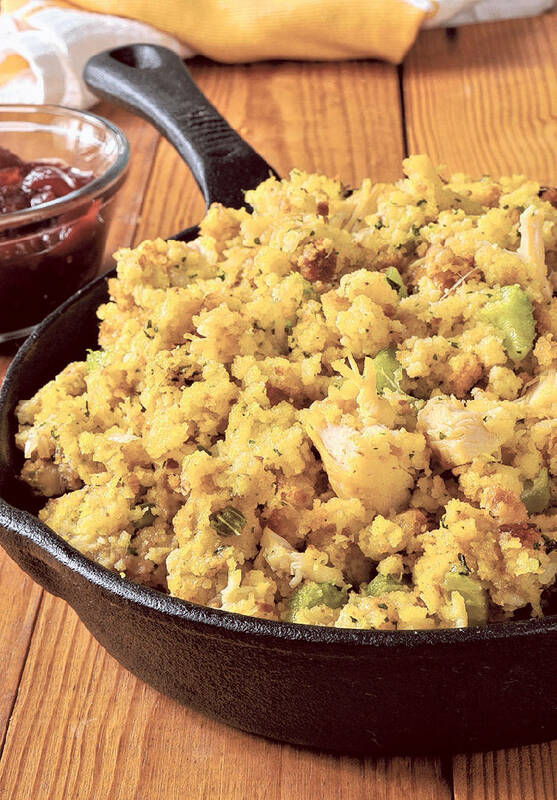 Following are recipes for a four-ingredient stuffing, gluten-free stuffing and a basic stuffing for first-time Thanksgiving cooks, along with the Fussell family's six-generation dressing favorite. Heat oven to 500 degrees. Put 9-inch cast-iron skillet in cold oven and let it heat up as oven does. When oven is hot, add 3 tablespoons of vegetable oil to the skillet and return to the oven. Keep an eye on it so it does not smoke. Mix dry ingredients. Beat egg into the buttermilk and add it to the dry ingredients. Mix thoroughly. Remove skillet from oven, carefully pour batter into the skillet and return it to the oven. Bake for 15 to 20 minutes in the middle of the oven. Remove from oven and and turn out round loaf onto a cooling rack. In a large mixing bowl, mix crumbled cornbread, 2 cups croutons or stuffing mix, crumbled biscuits. In a cast iron skillet, saute onion, celery in 2 tablespoons butter. Add one cup turkey broth to vegetables and deglaze the skillet. Let cool. When cool, beat in egg plus one tablespoon of water. Drizzle the vegetable/broth mixture over dry ingredients in mixing bowl, slowly tossing. If dressing seems too dry, use additional turkey broth in small amounts, tossing mixture as it is added. Turn out mixture into a greased Pyrex dish. Cover with aluminum foil and bake 30 minutes at 350 degrees. Remove foil and lightly test center of dressing with finger or spoon. If it makes an impression, remove the foil and bake another 10 minutes to brown top. Heat the oven to 350 degrees. Generously butter a 3-quart baking dish. Combine the stock, rice blend, quinoa and 1 1/2 teaspoons of salt in a large pot. Bring to a boil, stir once and cover. Reduce the heat to low and cook until the grains are tender and most of the liquid has been absorbed, about 18 minutes. Remove from heat. Meanwhile, melt the butter in a large skillet over medium heat. Add onions and cook until very soft (about 10 minutes), and then stir in the parsnips and garlic and cook until nicely browned (7 minutes). Add mushrooms and thyme and cook about 5 minutes , stirring, until mushrooms are tender. Combine the grains, vegetable mixture, apricots, if using, parsley, 1 teaspoon salt and 1/4 teaspoon pepper in a large bowl. Pour into the prepared baking dish and bake until the top is nicely toasted, 25 to 30 minutes. Serve hot. Yields 8-10 servings. Cook bacon in a heavy skillet until crisp. Turn heat down and add onions and celery; saute until tender, about 6 minutes. Add the thyme and sage and saute until fragrant. Stir in pecans. In a large bowl, add the cornbread mix, bacon and vegetables, and stir in the chicken broth. Pour into a 13 by 9 by 2-inch casserole dish. Add butter slices to the top of the casserole and cover with foil. Bake for 30 minutes, then remove foil and cook until top is crisp, about 15 more minutes. Melt 1 stick butter in a large skillet over medium heat. Add diced onions and celery, 2 chopped apples, sage and thyme. Season with salt and pepper and cook 5 minutes. Add chicken broth and bring to a simmer. Whisk both eggs with chopped parsley in a large bowl; add cubed bread, then pour in the vegetable-broth mixture and toss. Transfer to a buttered 3-quart baking dish and dot with more butter. Cover and bake 30 minutes, then uncover and bake until golden, about 20 more minutes. Bake at 350 degrees for 30 minutes or until the stuffing mixture is hot. Yields 10 servings.